Long before 1500 much of modern-Nigeria was divided into states identified with contemporary ethnic groups. These early states included the Yoruba kingdoms, the Igbo Kingdom of Nri, the Benin Kingdom, the Hausa cities, and Nupe. In addition, numerous small states to the west and south of Lake Chad were absorbed or displaced in the course of the expansion of Kanem, which was centered to the northeast of Lake Chad. Borno, initially the western province of Kanem, became independent in the late 14th century. Other states probably existed as well, but the absence of archaeological data prevents accurate dating. In the south, the earliest Edo state was Igodomigodo which emerged in 900 AD. Despite its relatively small size geographically it is considered the cradle of Edo culture. During the 15th century Benin Empire was referred to as Igodomigodo. The first dynasty of the Empire was the Ogiso dynasty, rulers who were known to their people as the kings of the Sky. Ogiso is the first ruler in West Africa Region to receive foreign traders. 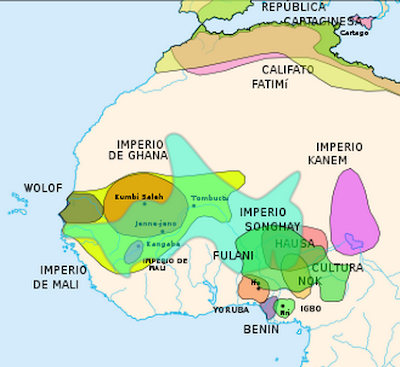 The West African empire centered on Benin City, in modern-day Nigeria. The ancient Benin homeland (not to be confused with the modern-day and unrelated Republic of Benin, which was then known as Dahomey) has been and continues to be mostly populated by the Edo (also known as the Bini or Benin ethnic group). Most scholars have argued that Igbo society was "stateless" and that the Igbo region did not evolve centralized political institutions before the colonial period. According to this theory, the relatively egalitarian Igbo lived in small, self-contained groups of villages organized according to a lineage system that did not allow social stratification. An individual's fitness to govern was determined by his wisdom and his wisdom by his age and experience. Subsistence farming was the dominant economic activity, and yams were the staple crop. Land, obtained through inheritance, was the measure of wealth. Handicrafts and commerce were well developed, and a relatively dense population characterized the region. Despite the absence of chiefs, some Igbo relied on an order of priests, chosen from outsiders on the Northern fringe of Igboland, to ensure impartiality in settling disputes between communities. Igbo gods were numerous, but their relationship to one another and to human beings was essentially egalitarian, thereby reflecting Igbo society as a whole. A number of oracles and local cults attracted devotees, while the central deity, the earth mother and fertility figure, Ala, was venerated at shrines throughout Igboland. The weakness of this theory of statelessness rests on the paucity of historical evidence of precolonial Igbo society. There are huge lacunae between the archaeological finds of Igbo Ukwu, which reveal a rich material culture in the heart of the Igbo region in the eighth century A.D., and the oral traditions of the twentieth century. In particular, the importance of the Nri Kingdom, which appears to have flourished before the seventeenth century, often is overlooked. The Nri Kingdom was relatively small in geographical extent, but it is remembered as the cradle of Igbo culture. In another theory however, The Nri Kingdom in the Awka area was founded in about 900 AD in North Central Igboland. The Nsukka-Awka-Orlu axis is said to be the oldest area of Igbo settlement and therefore, homeland of the Igbo people. This ancient kingdom is still considered the cradle of Igbo culture. The Nri people are children of the historical and mythical divine king Eri (founder of Aguleri of the Umueri clan on the Anambra river valley). It was a center of spirituality, learning, and commerce. They were agents of peace and harmony whose influence stretched beyond Igboland. The Nri people's influence in neighboring lands was especially in Southern Igalaland in the 12th to 15th centuries. As great travelers, they were also business people involved in the long distant Tran Saharan trade. The development and sophistication of this civilization is evident in the bronze castings found in Igbo Ukwu, an area of Nri influence. As far as historical memory extends, the Yoruba have been the dominant group on the West bank of the Niger. Of mixed origin, they were the product of the assimilation of periodic waves of migrants who evolved a common language and culture. The Yoruba were organized in patrilineal descent groups that occupied village communities and subsisted on agriculture, but from about the eleventh century A.D., adjacent village compounds, called ile, began to coalesce into a number of territorial city-states in which loyalties to the clan became subordinate to allegiance to a dynastic chieftain. This transition produced an urbanized political and social environment that was accompanied by a high level of artistic achievement, particularly in terracotta and ivory sculpture and in the sophisticated metal casting produced at Ife. The brass and bronze used by Yoruba artisans was a significant item of trade, made from copper, tin, and zinc either imported from North Africa or from mines in the Sahara and northern Nigeria. The Yoruba placated a luxuriant pantheon headed by an impersonal deity, Olorun, and included lesser deities, some of them formerly mortal, who performed a variety of cosmic and practical tasks. One of them, Oduduwa, was regarded as the creator of the earth and the ancestor of the Yoruba kings. According to a creation myth, Oduduwa founded the city of Ife and dispatched his sons to establish other cities, where they reigned as priest-kings and presided over cult rituals. Formal traditions of this sort have been interpreted as poetic illustrations of the historical process by which Ife's ruling dynasty extended its authority over Yorubaland. The stories were attempts to legitimize the Yoruba monarchies--after they had supplanted clan loyalties--by claiming divine origin. In most theory, Yoruba and Benin history were interconnected. In fact, areas to the west of Nigeria, in the modern Republic of Benin, were also closely associated with same history, both in the period before 1500 and afterward. Trade was the key to the emergence of organized communities in the savanna portions of Nigeria. Prehistoric inhabitants, adjusting to the encroaching desert, were widely scattered by the third millennium B.C., when the desiccation of the Sahara began. Trans-Saharan trade routes linked the western Sudan with the Mediterranean from the time of Carthage and with the upper Nile from a much earlier date, also establishing an avenue of communication and cultural influence that remained open until the end of the nineteenth century. By these same routes, Islam made its way south into West Africa after the ninth century A.D.
By then a string of dynastic states, including the earliest Hausa states, stretched across the western and central Sudan. The most powerful of these states were Ghana, Gao, and Kanem, which were not located within the boundaries of present-day Nigeria but which nonetheless had an indirect influence on the history of the Nigerian savanna. Ghana declined in the eleventh century but was succeeded by Mali, which consolidated much of the western Sudan under its imperial rule in the thirteenth century. 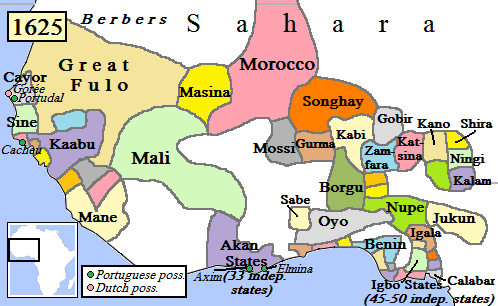 Songhai emerged as an empire out of the small state of Gao in the fifteenth century. For a century, Songhai paid homage to Mali, but by the last decade of the fifteenth century it attained its independence and brought much of the Malian domains under its imperial sway. 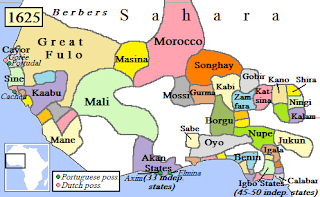 Although these western empires had little political influence on the savanna states of Nigeria before 1500, they had a strong cultural and economic impact that became more pronounced in the sixteenth century, especially because these states became associated with the spread of Islam and trade. In the sixteenth century, moreover, much of northern Nigeria paid homage to Songhai in the west or to Borno, a rival empire in the east. Borno's history is closely associated with Kanem, which had achieved imperial status in the Lake Chad basin by the thirteenth century. Kanem expanded westward to include the area that became Borno. Its dynasty, the Sayfawa, was descended from pastoralists who had settled in the Lake Chad region in the seventh century. The mai (king) of Kanem ruled in conjunction with a council of peers as a constitutional monarch. In the eleventh century, the mai and his court accepted Islam, as the western empires also had done. Islam was used to reinforce the political and social structures of the state, although many established customs were maintained. Women, for example, continued to exercise considerable political influence. The mai employed his mounted bodyguard, composed of abid (slave-soldiers), and an inchoate army of nobles to extend Kanem's authority into Borno, on the western shore of Lake Chad. By tradition the territory was conferred on the heir to the throne to govern during his apprenticeship. In the fourteenth century, however, dynastic conflict forced the then-ruling group and its followers to relocate in Borno, where as a result the Kanuri emerged as an ethnic group in the late fourteenth and fifteenth centuries. The civil war that disrupted Kanem in the second half of the fourteenth century resulted in the independence of Borno. Borno's prosperity depended on its stake in the trans-Sudanic slave trade and the desert trade in salt and livestock. The need to protect its commercial interests compelled Borno to intervene in Kanem, which continued to be a theater of war throughout the fifteenth and into the sixteenth centuries. Despite its relative political weakness in this period, Borno's court and mosques under the patronage of a line of scholarly kings earned fame as centers of Islamic culture and learning. By the eleventh century, some of the Hausa states--such as those at Kano, Katsina, and Gobir--had developed into walled towns that engaged in trade and serviced caravans as well as manufactured cloth and leather goods. Millet, sorghum, sugarcane, and cotton were produced in the surrounding countryside, which also provided grazing land for cattle. Until the fifteenth century, the small Hausa states were on the periphery of the major empires of the era. According to tradition, the Hausa rulers descended from a "founding hero" named Bayinjida, supposedly of Middle Eastern origin, who became sarki (king) of Daura after subduing a snake and marrying the queen of Daura. Their children founded the other Hausa towns, which traditionally are referred to as the Hausa bakwai (Hausa seven). Wedged in among the stronger Sudanic kingdoms, each of the Hausa states acquired special military, economic, or religious functions. No one state dominated the others, but at various times different states assumed a leading role. They were under constant pressure from Songhai to the west and Kanem-Borno to the east, to which they paid tribute. Armed conflict usually was motivated by economic concerns, as coalitions of Hausa states mounted wars, against the Jukun and Nupe in the middle belt to collect slaves, or against one another for control of important trade routes. Commerce was in the hands of commoners. Within the cities, trades were organized through guilds, each of which was selfregulating and collected taxes from its members to be transmitted to the sarki as a pledge of loyalty. In return, the king guaranteed the security of the guild's trade. The surrounding countryside produced grain for local consumption and cotton and hides for processing. Islam was introduced to Hausaland along the caravan routes. The famous Kano Chronicle records the conversion of Kano's ruling dynasty by clerics from Mali, demonstrating that the imperial influence of Mali extended far to the east. Acceptance of Islam was gradual and was often nominal in the countryside, where folk religion continued to exert a strong influence. Non-Islamic practices also were retained in the court ceremonies of the Hausa kings. Nonetheless, Kano and Katsina, with their famous mosques and schools, came to participate fully in the cultural and intellectual life of the Islamic world. Fulbe pastoralists, known in Nigeria as Fulani, began to enter the Hausa country in the thirteenth century, and by the fifteenth century they were tending cattle, sheep, and goats in Borno as well. The Fulani came from the Senegal River valley, where their ancestors had developed a method of livestock management and specialization based on transhumance. The movement of cattle along north/south corridors in pursuit of grazing and water followed the climatic pattern of the rainy and dry seasons. Gradually, the pastoralists moved eastward, first into the centers of the Mali and Songhai empires and eventually into Hausaland and Borno. Some Fulbe converted to Islam in the Senegal region as early as the eleventh century, and one group of Muslim Fulani settled in the cities and mingled freely with the Hausa, from whom they became racially indistinguishable. There, they constituted a devoutly religious, educated elite who made themselves indispensable to the Hausa kings as government advisers, Islamic judges, and teachers. Other Fulani, the lighter-skinned pastoral nomads, remained aloof from the Hausa and in some measure from Islam as well, herding cattle outside the cities and seeking pastures for their herds. The city-state of Akwa Akpa was founded in 1786 by Efik families (a branch of the Ibibio) who had left Creek Town, further up the Calabar River. They settled on the east bank in a position where they were able to dominate traffic with European vessels that anchored in the river, and soon became the most powerful Ibibio merchants in the region.